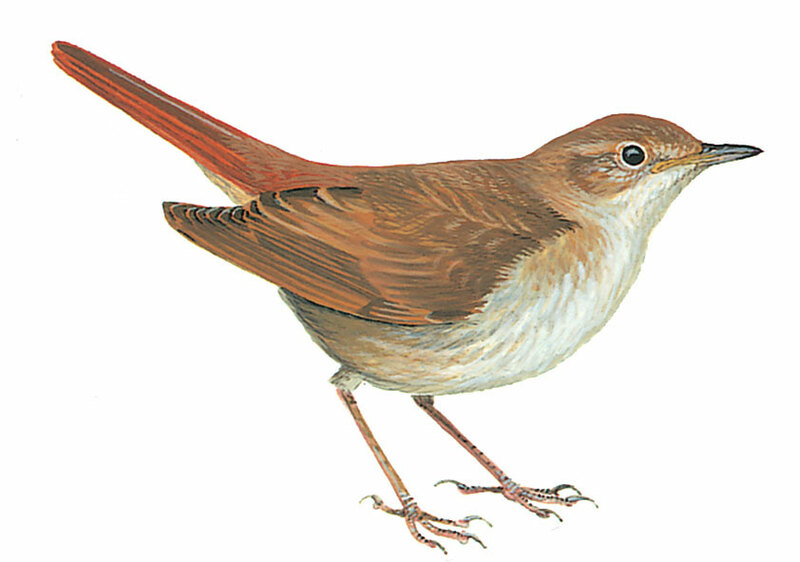 Very similar to Thrush Nightingale but more russet-brown upper-parts, paler, rusty red tail, and often more conspicuous whiter eye-ring; underparts more ‘clean’, lacking mottled impression on breast and flanks. The central Asian race hafizi, which migrates through the eastern part of the region, shows pale fringes to the tertials and greater coverts, paler underparts and a pale supercilium; the upperparts are less russet, more greyish-brown. Juvenile spotted buff and brown above and on breast and flanks, pale spots on median wing-coverts. Skulking, even when singing. Song fairly helpful for separating from Thrush Nightingale. Often in more dry habitat than Thrush Nightingale.